Cold? This hot cider cocktail is half tea, half juice, with a shot of booze for fun. Have I mentioned how much I totally adore Dunc's Mill elderflower rum? Well, if I haven't, I am now. It's great stuff, and adds a gentle floral note to whatever you use it in without imparting any extra sweetness. Here it is, pollinating a spicy cup of hot cider on a Tuesday afternoon. Why? You know why. Warm up four mugs with hot water. Heat the cider (not the hard stuff, but the nice, fresh cloudy kind that comes in gallon or half-gallon jugs) in a saucepan over medium heat. Add the tea bags, cinnamon and allspice and simmer until the tea steeps into the juice, about seven minutes. The caffeine from the tea means you can drink this mid-afternoon, right? Remove the cider from the heat and pour into a nice teapot (with the teabags) if you've got one. 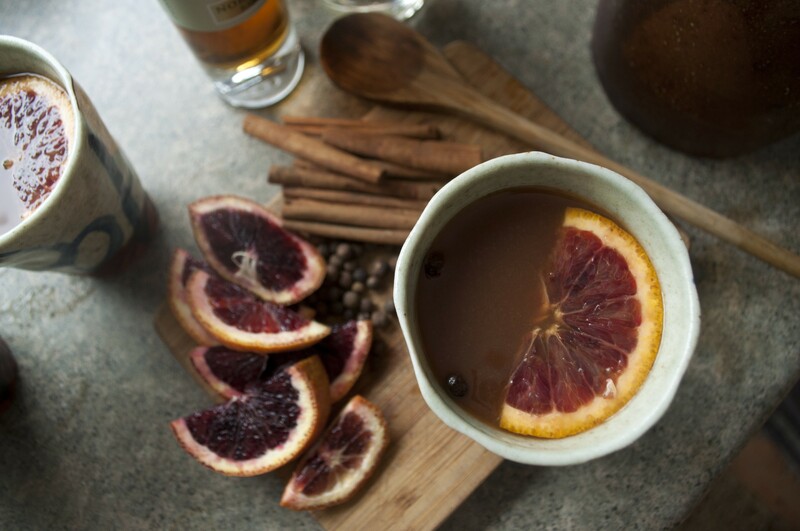 Top off each mug with the hot cider, garnish with an orange slice (blood oranges if you've got 'em) and a couple allspice berries. Last but not least: Float just a splash (1/4 teaspoon or less) of Barrel-aged ice cider on top of the cocktail. This adds just a hint of smoky, subtle, grown-up nuance. Sip, holding the mug with both hands, in front of an open fire. It's Raining. How About a Refreshing Tipple?